RubberBond FleeceBack EPDM flat roofing system has been awarded the British Board of Agrémentcertificate, No. 02/3967. Companies and individuals using products with BBA approval can do so in the knowledge that that they will perform, as set out in the certificate. If work is to be inspected by building control, the NHBC or any other industry professionals, the use of approved products should avoid any problems with compliance with building regulations or other issues. As a member of the RIBA NBS Plus service, we can provide the client with a bespoke NBS format specification for any project. Alternatively our technical team can always provide bespoke RubberBond FleeceBack specifications, which enable a more detailed project specific specification and can be used by those not using the NBS format. UK construction industry professionals can access more information about the RubberBond FleeceBack product range at www.ribaproductselector.com. Industry professionals will be able to find contact details, web addresses, case studies, product information and more about the RubberBond product range from our company overview page on the site. The Construction Products Regulation (CPR) has been adopted by the European Commission and UK Government from the 1st July 2013 to ensure that construction products meet the CE requirements of the new Regulation. So any flat roofing products that fall under this definition that are placed on the market from July 2013 and are covered by a harmonised standard EN 13956:2012 “Flexible sheet for waterproofing – Plastic and rubber sheets for waterproofing”, must be accompanied by a Declaration of Performance and will need to display the CE mark. The Document of Performance (DOP) that accompany the CE-marking of the RubberBond FleeceBack EPDM membranes can be viewed or downloaded here. 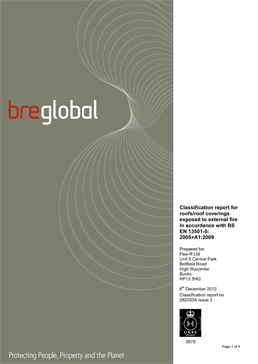 Recognising fire resistance capabilities is an important performance attribute of most roof systems and to ensure it is being installed within local government regulations. A wide variety of fire classification reports are available for RubberBond FleeceBack EPDM to view or download click the relevant test below. For further information please contact the RubberBond Technical Department.